Introducing a semi-regular series ranking the relative effectiveness, influence, and delirium of the NBA's two most important wing players. Sports journalism takes its power rankings seriously. Likewise, Alex Siquig and Jonny Auping take their self-hating, all-annihilating, mosquito-toward-a-bug-zapper observation of JR Smith and Dion Waiters seriously. It was only inevitable that they would create the JR Smith/Dion Waiters Power Rankings (trademark pending), and that it would run here, and that it would destroy them. Read on for the first installment. Alex Siquig: Two men locked in a war for Misunderstood Talented Bonehead Supremacy. Jonathan Auping: Basic power ranking rules apply. Eligible players—that is, Dion Waiters and JR Smith—can range anywhere from the coveted number one spot all the way down to last place, at number two. What will be the criteria for position in the rankings? The committee will once again defer to traditional power ranking norms and rely on arbitrary and opaquely reasoned decision-making. Future editions of the power rankings will be themed in some way based on recent play, recent shenanigans, or a number of other timely tropes that might apply to these two men. This being the inaugural edition, we’ll just speak generally about both men and determine their relative position in the rankings. JA: Those are just basic facts about Dion Waiters. How would you classify his style of play? AS: He plays like a man that has no relatives, like a man trying to remake and rebuild and repair his legacy in real time, like a man who knows that eventually he’ll be living in the city of Philadelphia and that, before Hinkie’s Process wraps it’s cold dead fingers around him, he has to make statements constantly, brusque burly statements—a 20-point game here, an acceptably nifty accidental drive there. But mostly he plays too much, shoots like a dang Stormtrooper, and has abdicated any of that Dwyane Wade-lite promise that once led serious and adequately qualified people to do crazy things like draft him or trade for him or play him nearly 30 minutes a night at the expense of folk hero/sniper Anthony Morrow. JA: Enough with the analytics. How can you justify his placement atop these power rankings? 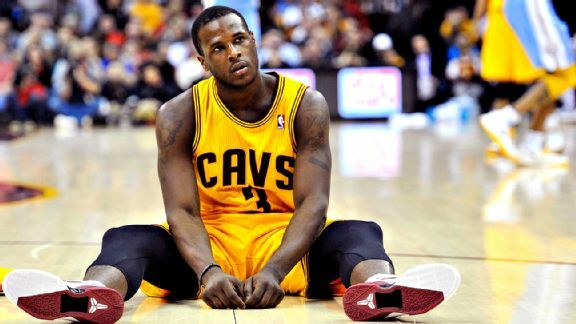 AS: Because Dion Waiters, boorish fuse that he is, is ultimately harmless. If he tried to burn the house down he’d forget where the matches were, or else burn himself and go sulk and then write a 1000-word entry in his Xanga. J.R. Smith knows how to use matches as well as a flamethrower, and his talent is occasionally so spectacularly incendiary that you start believing this pipe-laying one-man carnival midway could actually save the day down the stretch in a game that matters. There’s nothing J.R. Smith can’t do, at least for awhile. Unlike Waiters and his benign baby tantrums, J.R. Smith plays with a certain malevolence, which is not to say he is a dirty player per se—he absolutely is—but that he’s dangerous. To both teams. This is all well and good for an aspiring eight-seed looking to put a scare into the giants, but a contender doesn’t have the luxury of having one of its key player being an appendix that could burst at any moment, spraying Hennessy and hoverboard circuitry all over some very expensive machinery. JA: JR Smith could cost his team a championship. Dion Waiters might be too incompetent for even that. Kevin Durant and Russell Westbrook can freeze Waiters out and win based on their own tandem dominance, and after a play or two they’ll just confuse Waiters clapping for the ball with the collective applause of Thunder fans. In shooting a hilarious 1-14 in his two post-All Star break games he might soon find himself falling back in the depth chart, replaced by the newly acquired Randy Foye, who is like a sane man’s version of Waiters and Smith. Sunday afternoon Smith and Waiters each started and played over 30 minutes in a game that might end up being a preview of the NBA Finals, which is great if you’re launching a power rankings consisting solely of those two men, but not so great if you like watching well-played basketball. JR actually led the entire game in minutes played and scored 15 points as Cleveland throttled Oklahoma City. In a topsy-turvy way, it’s hard to imagine that’s a good thing for the Cavaliers’ future. JR Smith might have just earned himself ample opportunity on a team with extremely high stakes. Asking him to keep replicating it is like doubling down on a winning hand of blackjack. Waiters’ performance is like the sobering feeling of watching your chips get swept away and deciding you should probably take a few laps before going back in at a new table. If JR keeps it up he can take the top spot easily, but at the moment he seems more like a looming wildcard of liabilities for a team that already has enough of them. So Waiters starts these power rankings number one because it is the most conservative way to handle all of this. That is what these particular power rankings are about, for the moment anyway: playing it safe. It makes me sick when people compare Dion Waiters to J.R. Smith. JA: JR Smith is a play-from-behind type of player. If I told you that he has never looked at the scoreboard until the fourth quarter of every game he’s ever played in, would you believe me? JA: Of course you would. I don’t know if it’s true, personally, but I also believe it. AS: Cool. Do go on. JA: JR Smith is a manifestation of good vibes. Not to his teammates, coaches, or fans, though, of course, but definitely in his own mind. He lives in the belief that all the chaos around him—chaos that is usually caused by him—is bound to calm down and work out because it kind of always has for him. Much like the Philadelphia 76ers, JR Smith has his own Trust The Process philosophy, and the process in his case is merely the belief that his life is dope. An 0-for-7 night on the court is always just three shots away from a 3-for-10 night, which is fine enough, if you’re JR Smith and you walk away with a W, which you likely will because Lebron James is on your team. By the same standard, an 0-for-3 night at the club is just one closing-time DM away from a 1-4 night, and that’s not all that much different from a 1-for-1 night. Not to JR, at least. So give Dion the number one spot. God knows not having it might drive him to the brink of insanity. JR won’t sweat it. JR Smith is only number two until he’s number one. That’s how he’s always lived his life. It’s worked pretty well up to this point. He believes it will change, and he’s probably right.